long the banks of the River Dee, in Scotland, the Earls of Selkirk owned two castles. John Paul was landscape gardener at Saint Mary's Isle, and his brother George made the grounds beautiful at the Arbigland estate. Little John Paul stayed often with his uncle. At either place he could see the blue water, and he loved everything about it. At Arbigland he watched the ships sail by and could see the English mountains in the distance. From the sailors he heard all kinds of sea stories and tales of wild border warfare. When a tiny child, he used to wander down to the mouth of the river Nith and coax the crews of the sailing vessels to tell him stories. They liked him and taught him to manage small sailboats. He quickly learned sea phrases and used to climb on some high rock and give off orders to his small play-fellows, or perhaps launch his boat alone upon the waters and just make believe that he had a crew of men on board with whom he was very stern. For a few years this son of the Scotch gardener went to parish school, but his mind was filled with the wild stories of adventure, and he longed to see the world. John had a feeling that his life was going to be exciting, and he could not keep his mind on his books some days. He was not sorry when his mother told him that as times were hard, he must leave school and go to work. John's older brother, William, had gone to America, and his uncle George had ceased working for the Earls of Selkirk because he had saved enough money to go to America. He was a merchant, with a store of his own in South Carolina. John heard such glowing accounts of men getting rich and famous in that land across the sea that he felt it must be almost like fairy-land. Think how pleased he must have been when at the age of twelve he shipped aboard the ship Friendship, bound for Virginia! And best of all, this ship anchored a few miles from Fredericksburg, where his brother lived. When in port, John stayed with William. He loved America from the first moment he saw a bit of her coast, and he never left off loving our country as long as he lived. John went back and forth from America to Scotland on the Friendship a great many times. He had made up his mind that he would always go to sea, and he meant to understand everything about ships, countries to which they might sail, and all laws about trading in different ports. So he studied all the books he could get hold of that would teach him these things. Sometimes he changed vessels, shipping with a different captain. Sometimes he went to strange countries. But he was one who kept his eyes open, and he learned to be more and more skilful in all sea matters. About two years before the Revolutionary War, he was feeling discouraged. He knew his employers were pirates in a way. He had met with some trouble on his last voyage, so that he knew it was best not to go to his brother's when he reached North Carolina from the West Indies, and that he had best avoid using his own name. As he sat alone on a bench in front of a tavern one afternoon, his head in his hands, a jovial, handsome man came along. The man was well dressed, a kind-hearted, rich Southerner. He hated to see people unhappy. After he had passed John Paul, he turned back and going close to him, asked: "What's your name, my friend?" "I have none," was the answer. The stranger was struck with the face and figure of John Paul and noticed that his handsome black eyes had a commanding expression. He said to himself: "Here is a lad that will be of importance some day, or my name is not Willie Jones!" Then Willie Jones took John by the arm and said: "Come home with me. My home is big enough for us both." This was quite true, for Willie Jones had a beautiful estate called "The Grove." The house was like a palace with its immense drawing-rooms, wide fireplaces, carved halls, and spacious dining-room which overlooked the owner's race track. For Willie Jones owned blooded horses, went to country hunts, played cards, and had overseers to manage his fifteen hundred slaves, who worked in Jones's tobacco fields and salt mines. His clothes were of the first quality and his linen fine. On a neighboring estate across the river lived Willie's brother, Allen Jones. He was married to a dark-eyed beauty who gave parties in her large ballroom, and who led the minuets and gavottes better than any of her guests. Just as John Paul had been at home on the estates of the Earl of Selkirk in Scotland, he was now at home on both these southern plantations. By both families he was petted and soon beloved. He seemed like one of their own blood. The people of North Carolina talked constantly of Liberty. They declared themselves anxious to be independent of England. Soon after the famous Boston Tea-party, the women of North Carolina pledged their word to drink no more tea that was taxed. John Paul took the same stand as his good friends. And he more than ever felt he was born to do great deeds. And he hoped to prove his gratitude to the Joneses by winning fame. 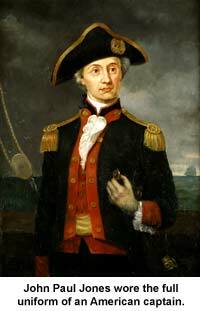 From this time he took the name of John Paul Jones. All his navy papers are signed that way. And he became an American citizen. Paul Jones's rise was rapid. In 1776 he became a lieutenant in the Continental navy. The colonists had but five armed vessels; the Alfred, on which Paul Jones served, was one of them. These five ships were the beginning of the American navy. The captain of the Alfred was slow in reaching his vessel, and so Paul Jones had to get the ship ready for sea. He was so quick and sure in all his acts that the sailors all liked him. The ship was visited by the commodore of the squadron of five ships. He found everything in such fine condition that he said: "My confidence in you is so great that if the captain does not reach here by the time we should get away, I shall hoist my flag on your ship and give you command of her!" "Thank you, Commodore," and Paul bowed, "when your flag is hoisted on the Alfred, I hope a flag of the United Colonies will fly at the peak. I want to be the man to raise that flag on the ocean." The commodore laughed and replied: "As Congress is slow, I am afraid there will not be time to make a flag after it actually decides what that shall be." "I think there will, Sir," answered Paul Jones. It seems he knew almost for a certainty that the Continental Congress had planned their first flag of the Revolution. It was to be of yellow silk, showing a pine tree with a rattlesnake under it, and bearing the daring motto: "Don't tread on me." Paul Jones had bought the material to make one, out of his own pocket, and Bill Green, a quarter-master, sat up all night to cut and sew the cloth into a flag. Captain Saltonstall arrived in time to take command, but Paul Jones kept his disappointment to himself and faithfully did the lieutenant's duties. He had been drilling the men, and when the commodore came again to inspect the ship, some four hundred, with one hundred marines, were drawn up on deck. Bill Green and Paul Jones were very busy for a minute, and just as the commodore came over the ladder at the ship's side, the flag with the pennant flew up the staff, under Paul Jones's hand. Every man's hat came off, the drummer boys beat a double ruffle on the drums, and such cheers burst from every throat! The commodore said to Paul Jones: "I congratulate you; you have been enterprising. Congress adopted that flag but yesterday, and this one is the first to fly." Bill Green was thanked, too, and the squadron sailed for the open sea, the Alfred leading the way. Paul Jones was very daring, but his judgment and knowledge were so perfect that in the twenty-three great battles which he fought upon the seas, though many times wounded, he was never defeated. He made the American flag, which he was the first to raise, honored, and he kept it flying in the Texel with a dozen, double-decked Dutch frigates threatening him in the harbor, while another dozen English ships were waiting just beyond to capture him. He was offered safety if he would hoist the French colors and accept a commission in the French navy, but he never wavered. It was his pride to be able to say to the American Congress: "I have never borne arms under any but the American flag, nor have I ever borne or acted under any commission except that of the Congress of America." Paul Jones served without pay and used nearly all of his private fortune for the cause of independence. Congress made him the ranking officer of the American navy and gave him a gold medal. France conferred the cross of a military order upon him and a gold sword. It was a beautiful day when this cross was given him. The French minister gave a grand fete in Philadelphia. All Congress was there, army and navy officers, citizens, and sailors who had served under Jones. Against the green of the trees, the uniforms of the officers and the white gowns of the ladies showed gleamingly.